When looking for the origin of Shitō-ryū one will first run into its founder Mabuni Kenwa (1889 – 1952). Kenwa was born in Shuri in 1889. An ancestor of the House of Mabuni during the Ryūkyū Kingdom era was Oni Ufugusuku 鬼大城, who was famous for his valor. Kenwa was a feeblish child. Impressed with the tales of heroic deeds of his ancestor he thought he needed to somehow achieve a robust health and body. In those days, Itosu Ankō was famous in Okinawa. As he lived in Shuri, through the introduction by an acquaintance Kenwa was accepted as a disciple of Itosu’s. This was around 1903 when Kenwa was about 15 years old. From among Itosu’s disciples noted karate practitioners turned out in great numbers, such as Yabu Kentsū, Hanashiro Chōmo, Yamakawa Tōryō, Chibana Chōshin, Tokuda Anbun, Shiroma Shinpan and others. It is said that after having become Itosu’s disciple, Kenwa wouldn’t stop practicing for even one day and even visited his masters house during the strong wind and rain of typhoons, for which he was scolded by his master. Since around 1908 when he was about 20 – by introduction of his friend Miyagi Chōjun – Kenwa also began to study under Higaonna Kanryō. The name Shitō-ryū indicates these two streams of Okinawa karate. In those days karate was not as widespread as it is today, and it was also not a time where people could pick a sensei by themselves. In addition, there was no such thing as a dōjō where students could matriculate. It seems that without the introduction of influential friends disciples were not easily accepted. Following graduation from middle school Kenwa entered mandatory military service and afterwards became a policeman. Since he worked as a police detective for nearly 10 years, his study of karate turned out to be of extremely practical value in arresting criminals and similar matters typical for the nature of this kind of job. During this period as a police officer and in addition to being attracted to jūdō and kendō, through his service as a policeman in various places in Okinawa Kenwa also studied karate and bōjutsu from Aragaki Seishō, saijutsu from Tawada, and the bōjutsu of Soeishi-ryū. In this way, by touring around the regions as a police officer, he had the opportunity of learning all sorts of budō. 1918, at the age of 29, Kenwa established the Karate Kenkyūkai 唐手研究会 at his house as a meeting place. During nighttime practice took place with electric light in the garden. In this year, on occasion of both the Imperial Princes Kuni-no-miya and Kachō-no-miya visiting Okinawa Prefecture, Kenwa demonstrated karate at the Shuri Normal School (Shihan-gakkō). In 1924 he was appointed budō teacher at the prefectural fishery school as well as karate-dō teacher at the Shuri Normal School (Shihan-gakkō). In the same year he demonstrated karate on occasion of the visit by Imperial Prince Chichibu. In October 1925 the Karate Kenkyūkai was reorganized and reestablished as the Okinawa Karate Kenkyū Kurabu 沖縄唐手研究倶楽部. It was the first time a private dōjō had been established for the training of younger people. Among the instructors were Kiyoda Juhatsu, Motobu Chōyū, Hanashiro Chōmo, Ōshiro Chōyo, Chibana Chōshin and the Chinese kenpō expert Go Kenki. Mabuni Kenwa and Miyagi Chōjun served as full-time chief instructors. This dōjō was provided with various training equipment (makiwara, sagi-makiwara, makiage, sāshī, tetsu-geta and others) and it was an ideal dōjō for the purpose of karate. In 1927, Miyagi Chōjun and Mabuni Kenwa gave an introduction to karate on occasion of the visit of Kōdōkan director Kanō Jigorō for the dōjō-opening of the “Okinawa Jūdō Blackbelt Association“. At that time they both received praise by Kanō, who said “With its freely usable offense and defense, it [karate] is an ideal budō to be propagated extensively in all Japan”. Wouldn’t that have been Mabuni’s trigger to travel to the Japanese main island in order to popularize karate? Mabuni moved to Ōsaka in 1929 and began to teach karate. Members of the Kansai University jūdō club participated, as well as Sawayama Masaru (Muneomi), who would later become the founder of Nihon Kenpō, as well as several other people. At the time Kenwa did not have his own dōjō, but practiced at his Japanese-style home, a dōjō of the size of six ragged tatami. Mabuni Kenwa also studied Japanese martial arts himself, like Nihon-den Kenpō Shinden Fudō-ryū 日本伝拳法神伝不動流 from Yata Noriyuki 矢田徳幸 and Tenshin-ryū 天心流 from Ueno Takashi 上野貴天心. In 1930 Miyagi Chōjun designated his school of karate by the name of Gōjū-ryū. In the following year Mabuni Kenwa named his own school Mabuni-ryū 摩文仁流 and in 1934 he published Kōbō Jizai Goshin-jutsu Karate Kenpō and Karate Kenpō Sēpai no Kenkyū. In the same year 1934 Mabuni opened his own dōjō called the Yōshūkan 養秀館 in Ōsaka. There he used the appellation “Shitō-ryū” for the first time by combining the first characters of both his teachers’ names, Itosu and Higaonna. Five years later, in 1939 Mabuni registered Shitō-ryū as an official ryūha-name with the Dai Nippon Butokukai HQ. Later the same year, with karate also gradually gaining publicity under students, karate clubs were established in each university in the Kansai region and Mabuni established the Greater-Japan Karate Association (Dai Nippon Karate-dō Kai) as the national organization aiming at the education of karate teachers. There are some things to notice here. First of all, Mabuni Kenwa does not use a classification according to the highly problematic and inaccurate Shuri-te and Naha-te, as was later done. Instead, that which he referred to as the “current kata” of his system were 33 kata the origin of which were named after the persons he learned them from, namely the “Itosu lineage” and the “Higaonna lineage”. 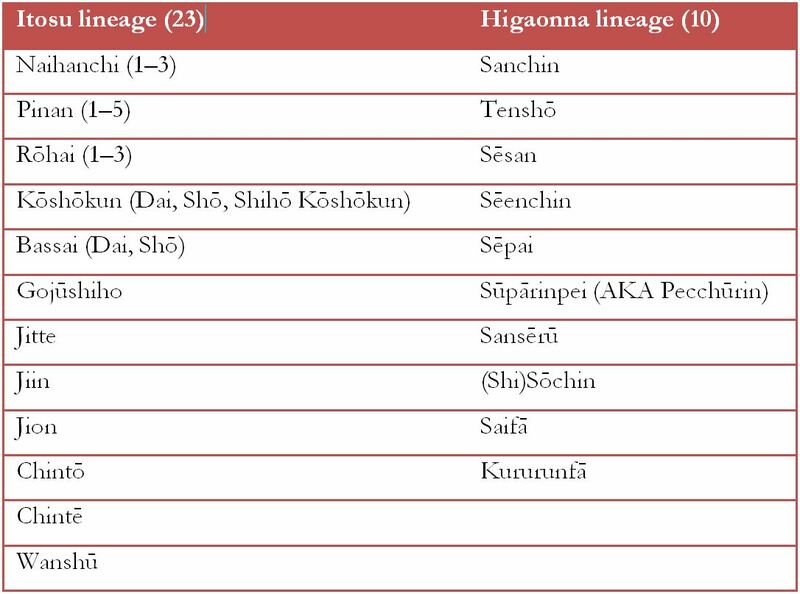 Third, he mentioned other varieties of existing kata, most notably three kata from the “Aragaki lineage”, namely Nīsēshi, Unshū, and Sōchin. Mabuni Kenwa’s greatest achievement was to make karate widely known on the Japanese main island. In 1952 his life ended in Ōsaka. He was 63 years old. Following Mabuni Kenwa’s demise many offshoots emerged which associated themselves with Mabuni Kenwa and began the multitude of associations that use the name “Shitō-ryū” in their self-appellations. Mabuni Ken’ei, in: OKKJ 2008: 525. Mabuni Ken’ei, in: OKKJ 2008: 525–526. Mabuni Ken’ei, in: OKKJ 2008: 526. OKKJ 2008: 170. The author of the OKKJ entry is Yokoyama Masahiko, a shihan under the 2nd soke of Shitō-ryū Mabuni Ken’ei. For this reason he takes a position of orthodox Shitō-ryū, that is, not as progressively sports-oriented as the JKF Shitōkai faction that is involved in the large-scale sportification of all Okinawan kata under the name of Shitō-ryū in the recent 50 years. Yokoyama was the editor and to a degree the ghostwriter of the following influential work: Mabuni Ken’ei (author) and Yokoyama Masahiko (ed. ): Budō karate he no Shōtei (Invitation towards Budō Karate). Sankōsha, 2001. 摩文仁賢栄著 横山雅彦編: 武道空手への招待. 三交社, 2001. Yokoyama Masahiko, Mabuni Ken’ei, in: OKKJ 2008: 171, 526. Dai Nippon Karate-dō Kai 大日本空手道会. After the war it was renamed to Shitō-ryū’s Japan Karate Association (Nihon Karate-dō Kai 日本空手道会). Yokoyama Masahiko, Mabuni Ken’ei, in: OKKJ 2008: 171; 526. OKKJ 2008: 171. Watatani & Yamada 1978: 353. It is also said he first named his school Hankō-ryū 半硬流 or half-hard-style. This entry was posted in Misc and tagged Mabuni Kenwa, Shito-ryu, 糸東流. Bookmark the permalink.